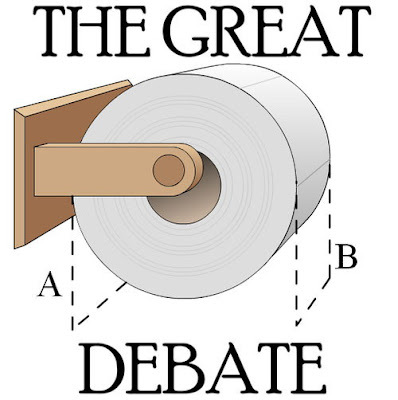 For me there is no debate. The most correct way to hang your bog roll is B: there's a larger "grab" space, it's always easier to roll towards you rather than away and due to the angles, it's easier to "swipe" and tear just the amount of paper you need (and so you don't have to touch the paper at all). Of course I still respect the opposing stance (even though I take it upon myself to switch As to Bs whenever I can and wherever I happen to be. You mat think this weird, but apparently I'm not the only one who does this). No, the real criminals are the fence sitting morons who don't have an opinion at all, as if this isn't an issue worth thinking about at all. The only thing worse than a wrong answer is an inconsistent one. Of course B is the correct way to hang your bog roll. What moron would choose A, or like you said, and even worse, not care!